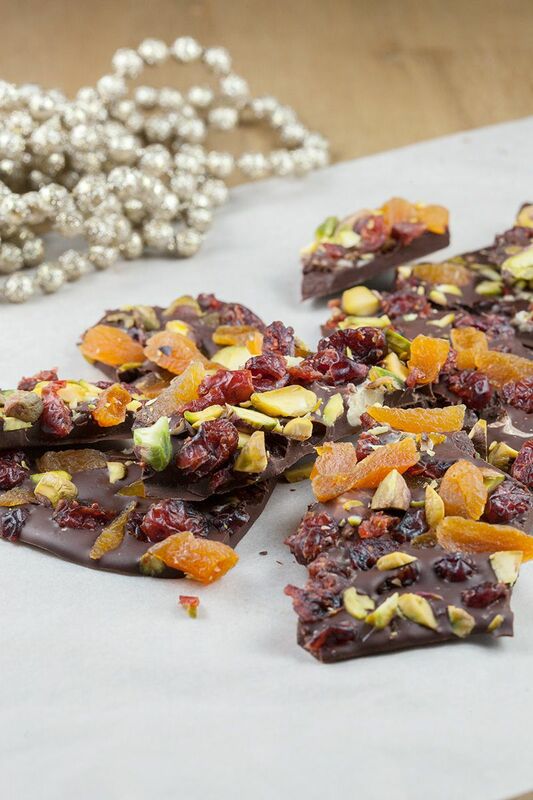 ROUGHLY chop up the pistachios, dried apricots and cranberries using the chef’s knife and cutting board. Set aside for now. Preparation = done! That’s how easy this recipe is. FILL the small pan about halfway with water. BRING to a boil, then add in the aluminium bowl. BREAK the pieces of chocolate into smaller chunks using your hands. ADD the chunks of chocolate into the aluminium bowl. This method of melting chocolate is called au bain marie (Marie’s bath). This process melts the chocolate without burning it. Gently stir the chocolate with a silicone spatula. Optionally repeat this step using white chocolate, this will make the end result way more sweet. Since white chocolate usually is made almost entirely with sugar. 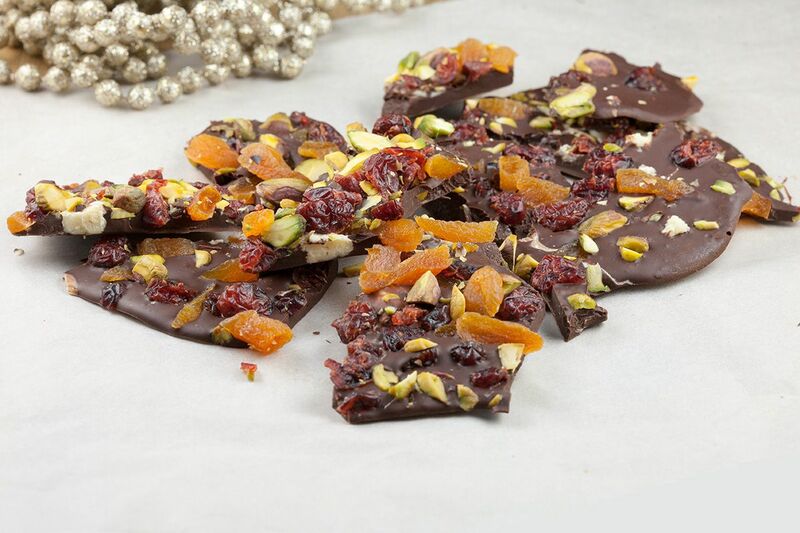 When the dark chocolate has melted completely, pour it on the pre-lined baking sheet. SPREAD it out a bit, in such a way that you’ll end up with the desired thickness. When using white chocolate: pour the white chocolate in long lines over the warm dark chocolate to create a pattern you like. 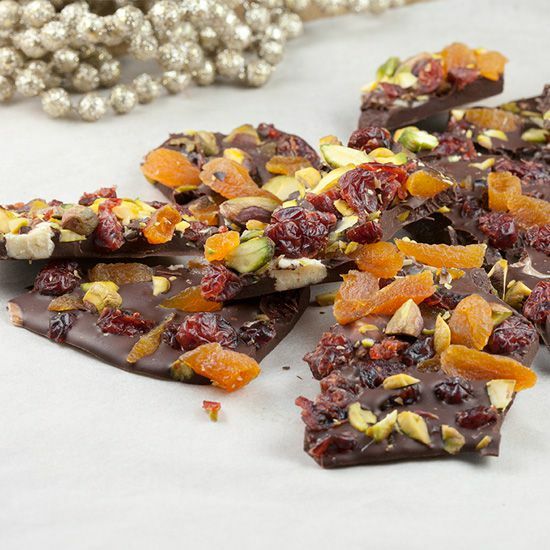 We didn’t use the white chocolate because we wanted the Christmas chocolate bark to be bitter instead of sweet, because there already is a lot of sweetness in the dried fruits. 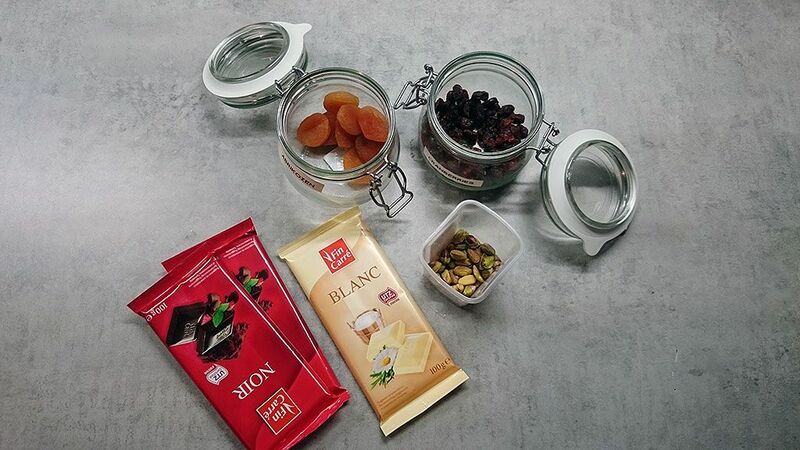 CRUMBLE over the nuts and dried fruits and let cool off to room temperature before cooling it in your refrigerator. CRACK the chocolate into large chunks, serve with hot cocoa, coffee or tea. Enjoy! Sure, send us your address to info@ohmydish.com and we’ll ship it to you!